The Indo Board (derived from the word indoor) was designed to be used indoors so that everyone from kids to senior adults to professional athle tes could enjoy the benefits of balance training and balance board exercises. Sitting for long periods, day in and day out, is bad for your health! Studies have shown that sitting is the new smoking. 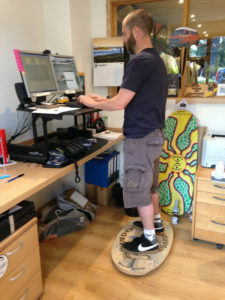 Using the Indo Board Standing Desk Balance Board activates the core and balance stabilizing system while you work which burns calories, improves posture and increases productivity. Active standing during meetings boosts the excitement around creative group processes and keeps people more engaged and alert. The Indo Standing Desk Balance Board is the most versatile standup desk accessory to complement your own Stand Up Desk Work Station. The Indo Board Original Deck and IndoFLO cushion combination is designed to stimulate the mind and activate your body, standing while working at your desk. 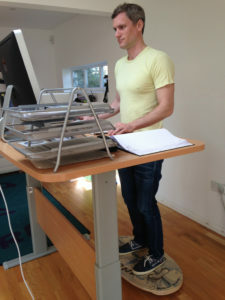 Recent studies have proven that standing at a workstation, on an unstable surface, is beneficial because it helps you burn calories, thereby increasing your energy and a lertness. 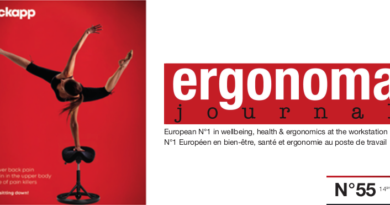 The result is a happier, healthier and more productive workplace.